Physician-philosopher Thomas Beddoes was a political radical and a well-intentioned philanthropist. With the financial support of Josiah Wedgewood, Beddoes established the Pneumatic Institution for Inhalation Gas Therapy in Clifton near Bristol. It opened in 1798, three years after Wedgewood's death. Beddoes aimed to apply and extend Joseph Priestley's ideas on the medical treatment of disease by the therapeutic inhalation of different "factitious airs" or gases and vapours. Beddoes appointed the precocious Humphry Davy as first superintendent of the Institution. 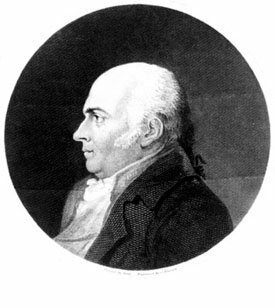 Davy conducted research into nitrous oxide in its laboratory. He left the Pneumatic Institution in March 1801 to join the fledgling Royal Institution in London. Dr Beddoes attacked popular lay practices of self-medication. He rightly felt they caused needless deaths. Unfortunately, the track-record of Beddoes and his contemporary physicians was little better. Pneumatology was neither safe nor effective. The Pneumatic Institution closed in 1802. Yet the influence of its work on gases and vapours was to prove seminal in the development of inhalation anaesthesia. Beddoes himself died a disappointed man. Writing on his deathbed, he penned a note to Davy: "Greetings from Dr. Beddoes, one who has scattered abroad the Avena Fatua [wild oats] of knowledge, from which neither branch nor blossom nor fruit has resulted."